Our brains are hardwired to detect and identify faces. The brain has a specific region for recognizing faces called the fusiform gyrus, or the fusiform face area. This specialized part of our brain helps us to identify faces within less than a second and to quickly distinguish one face from another. Our eyes tend to quickly locate and lock onto images of people and their faces. 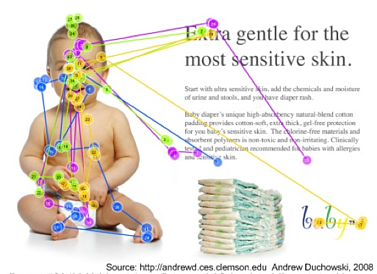 We have learned through eye tracking that the image of the human face is a powerful thing. The eye is naturally drawn to the face, and we often spend at least several moments looking at it. 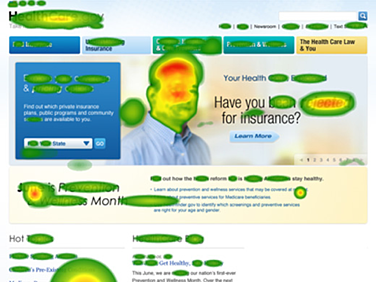 Eye tracking heatmaps reveal concentrations of attention, and can shed light on what areas your users are focusing on. Photos are often used on websites to add visual appeal and to help promote a particular feature or service. Photos displaying people can inadvertently drive attention away from key content and calls to action (CTAs). Eye tracking has historically shown that too much visual attention is being spent on images containing faces, which detract from what users should be focusing on. In the above photo, the image of the patient’s face has received significantly more attention than surrounding elements, including the navigation and key messaging. One could argue that the image does not really add any value to the page, and that it is not helping to guide or direct the user’s attention towards more useful content. 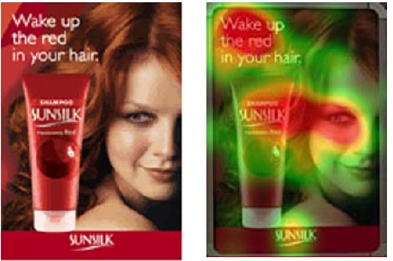 In the next example, eye tracking shows that when the model looks at us, we look at the model. It is natural behavior to make eye contact with a subject, regardless of whether it is with a physical person or an image of someone’s face. In this heatmap, we can see that the user’s attention is distributed across the model’s face, but this behavior does not encourage the user to engage with the product. 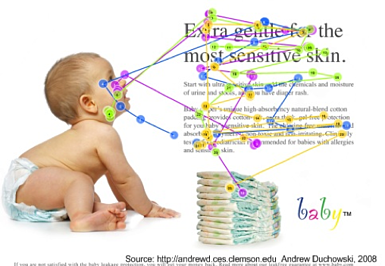 In a similar example below, participants looked at the baby’s cute face, but the image did nothing to encourage them to visually engage with the rest of the content. Both the image of the model and the baby can be redesigned to leverage the power of the face in a much more effective way. The image below is a great example of a designer using the face to alter the look patterns to subconsciously encourage people to look at the brand. 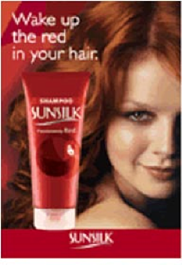 In this case, the designer only changed the model’s eye to be looking at the product. Humans are wired to subconsciously look in the direction that others are looking at. 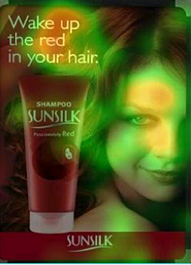 This subtle change is reflected in the heatmap, showing the visual attention “heat” being transferred from the model’s eye to the product. Changing the position of the baby so that it is looking at the text has a similar effect. The participant’s looked at the baby’s face and then followed the baby’s eye gaze to the header and subsequent content. If you use faces in your design, be strategic in how you use them. Use the power of the face to draw the eye to the area of the page that you want them to focus on and then make sure that it leads them to where you want them to look next. Key Lime Interactive uses eye tracking to better understand our users viewing patterns as part of a comprehensive research program. We have the latest eye tracking technology that allows us to study everything from websites to automobiles.